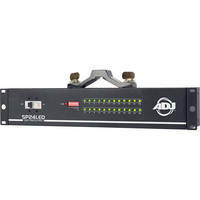 American DJ SP24LED 24-channel DMX Switch Pack DJParts - All Variety of Parts that DJ Needs. The American DJ SP24LED is a 24 channel DMX controlled switch pack that switches up to 24 LED fixtures on and off. The SP24LED uses an external DMX controller (sold separately) and features 24 Edison inputs. The SP24LED is an ideal solution for mobile DJs, nightclubs, stages and more.